I was in high school when I met him. Tall and thin, a violinist with an unusual career and an upsetting tendency towards depression and boredom – he was my kind of guy. Except for the fact that he was completely fictional. I’m talking, of course, about Sherlock Holmes. 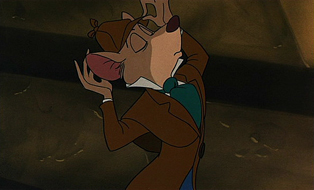 My first experience with Mr. Holmes was with the Disney version (which featured an anthropomorphic mouse named Basil), and while he was simply a cartoonish interpretation of the original, I was hooked. Being so young, I had no idea that he was based on Sherlock Holmes, but I still loved the idea of someone solving problems with common sense and simple observation rather than brute force. It was later that I started to read the stories and fell head over heels for the consulting detective and his variety of quirks. It was hardly a surprise to anyone that a few years afterwards, I started to watch House. Fun fact: If you look closely, House contains many homages to Holmes including, but not limited to, House’s apartment number: 221B! Even the casual drug usage is a nod to Sir Arthur Conan Doyle’s original Holmes. Let’s get something straight, first: I do prefer Doyle’s original stories. But when I saw the first Sherlock Holmes movie, I was thrilled. I loved Jude Law’s Watson. Movies have traditionally shown Dr. John Watson as portly and rather slow-witted. Law’s Watson is truer to Doyle’s original: handsome, limping and Holmes’ equal instead of a bumbling sidekick. 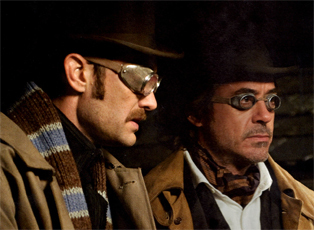 Downey’s Holmes delighted me and captured the original character more so than all other portrayals. The chemistry between these actors is hard to reproduce. Yes, purists whined, and normally I’m right there with them. But with the unique and updated version of Holmes that director Guy Ritchie offered us, I just couldn’t complain. The film was steampunked and had the perfect amount of explosions and action that couldn’t be captured in Doyle’s stories. When I heard they were making (the inevitable) sequel, I was thrilled. When I learned that Moriarty was the main villain, I was in nerdvana. Moriarty is to Holmes fans what Voldemort is to Potter fans – the ultimate villain that gives our beloved protagonist purpose. Moriarty is Holmes’ intellectual equal, which, as Holmes fans know, is no small thing. But Moriarty, much like the Joker, just wants to watch the world burn. Holmes, on the other hand, wants to save it. Moriarty only appears in one story, but his impact on the Holmes canon is violent and permanent. A Game of Shadows is vaguely based on Doyle’s story “The Final Problem.” Honestly, if Guy Ritchie had called the film The Final Problem, it would have made more sense. Between the movie’s title and the villain, I was nervous going in because it felt like Ritchie might attempt to create a new Holmes story, while ignoring Moriarty’s contribution to Doyle’s world. From the opening moments, it was clear that Ritchie was trying to replicate “The Final Problem” without feeling the pressure of the name. The movie makes every attempt to fill in the blanks of the (relatively vague) original story, which outlines Holmes’ attempt to capture Moriarty and put an end to his huge crime ring. For the most part, the film accomplishes that goal by creating the plot the original lacked (it had surprisingly little detail for a Holmes story) and with explosions. Lots of explosions. The explosions and slow-motion action were a bit overdone and became tedious about halfway through. There were points where connecting the dots to Doyle’s story worked for me. Then there were moments where it was just overkill. In the film, Holmes says to Moriarty, “If I were assured of the former, I would cheerfully accept the latter.” This is a wonderful quote, paraphrased from the original story, of Holmes’ willingness to accept any kind of victory over Moriarty. Except in the film, it didn’t make sense in the context in which it was spoken. At all. Moriarty hadn’t given him a choice of any kind. In the story, Holmes is referring to the option of putting Moriarty behind bars or flat-out defeating him. I leaned over to my friend to point out the quote, and she asked if she’d missed something. If you, like her, did not understand the line either, there you go. One early review I read said that A Game of Shadows wanted to maintain the Holmes/Watson boys’ club with minimal interference. I found that to be true. The women in the movie – three total – are superfluous. One (Watson’s new wife, Mary) serves her role for 10 minutes, but then becomes more of an annoyance when Watson completely forgets about her. To purists, this should be fine. Women play a minimal role in Holmes stories to the point where Holmes only visits Watson when Mary is away. The absence of women helps the viewer focus on the awesome Holmes/Watson bromance. I was excited, however, that Ritchie stayed true to the story’s end (mostly), as Holmes and Moriarty destroy each other with a dramatic fight and tumble over a waterfall. 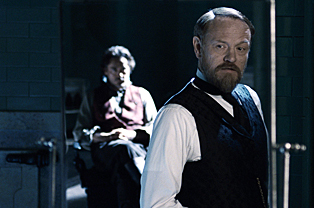 Doyle had intended “The Final Problem” to be just that – Holmes’ final story. He was sick of the character and wanted him dead. He killed Holmes and Moriarty in a way that suggested they could come back eventually and, thanks to fan demand, Holmes did – in The Hound of the Baskervilles. In A Game of Shadows, he returns at the very end, unbeknownst to Watson. All in all, A Game of Shadows is a fun movie, but it clearly tries too hard to impress Holmes fans. Doyle’s Holmes is the one I love the most – an intellectual who understands his own limitations and pushes them frequently to aid mankind. He is aloof, arrogant and odder than his poor roommate can often stand. And, while Downey’s Holmes is a close second, he’s just too scruffy and unsure of himself for this girl. If you’ve never read a Sherlock Holmes story, hit up Heather Sedlak on Twitter @8ozcup. She’ll recommend the perfect starter.